Starting a new workout or eating plan is easy; sticking to it isn’t. What do you do when, after the first couple months of a new eating or exercise regimen, you hit a place where you’re not making progress, your motivation is flagging, and you feel discouraged? Don’t worry. It happens to everyone. Here are six simple ways for you to move beyond negative emotions so you will get re-energized and refocused on your health and fitness goals. The National Institute for Occupational Safety and Health found that stress causes a decreased willingness to take on new endeavors. If you’re stuck in the same old eating and exercise habits, get out of that rut by clearing away the stress in your life. Increase your sleep; seek out lighthearted people and fun activities; reduce your intake of caffeine, sugar, and alcohol; and get more sun and fresh air. Reducing stress helps you regain the motivation to change. Believe it or not, fear is a key reason that we hit fitness plateaus and then stay there. By fighting your fear of failing, you’ll feel triumphant and gain a renewed sense of energy and purpose. When fear pops up and tells you it’s hopeless, fight back by breaking your task into the smallest steps you can manage — say, by doing the first 5 minutes of your workout — so you will experience yourself succeeding and chase away that fear. Many people respond well to structure. If winging it does not keep you on track, then make a schedule of your workouts and your personal goals each week. Hold yourself accountable to them. This creates clear, short-term, week-by-week goals. A written fitness schedule is akin to making a contract with yourself. Instead of beating yourself up for hitting a plateau, be good to yourself with your exercise. Recharge with an easier training session than planned. Make your workout into something soothing by reducing the intensity, cutting back on the length, finding a friend to come with you, or picking a route that has beautiful scenery. Sometimes the reason we get discouraged is because we allow our mood to influence our actions. Maybe you’ve had a bad day and tell yourself it’s pointless to work out, or you convince yourself it’s too hard. Instead, set aside a quiet time to reflect on your goals. One of the best times to do this is when you are trying to decide what your next step or workout should be. You’ll find that the choices you come up with will be quite different if the end goal is what influences the decision rather than your immediate mood or life constraint. Numerous studies show that if you visualize a goal–and then reinforce it by repeating that goal to yourself over and over–you will probably achieve whatever it is you set out to accomplish. Visualizing your success over and over again allows you to stay involved with your original enthusiasm. Use this any time there is a lull in your motivation. Shaman-healer and MacArthur Award finalist Brant Secunda and six-time world champion Ironman Mark Allen teach seminars worldwide on fitness, health, and well-being. 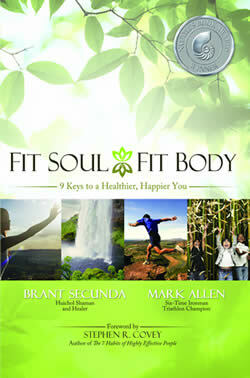 Their new book, based on the approach they developed, is Fit Soul, Fit Body: 9 Keys to a Healthier, Happier You (BenBella Books). Find out more at www.fitsoul-fitbody.com. After winning his first Ironman World Championship in 1989, Mark Allen’s family and friends were eager to learn what helped him pull ahead of his longtime triathlon rival, Dave Scott, in the final miles of the marathon. The answer surprised them, said the six-time Ironman champ. “I told them, ‘Well, I saw this picture of these shamans…'” he said. Allen is slated to tell more of this story, alongside one of those shamans, Brant Secunda, at two events in Boulder. Then, during a weekend retreat at Chautauqua, beginning Friday night, Allen and Secunda will delve deeper into the keys, they said. Secunda said the ideas are simple — like how to connect with nature, how to let go of stress, nutrition. And he says you don’t have to be an athlete — it’s for anyone. “We emphasize that what we talk about are tools that anyone can use, from losing weight, to getting more fit, to improving in a competition,” said Allen, who lived in Boulder to train for triathlons for about 12 years. Allen sought out Secunda after Ironman in 1989, and they’ve been working together ever sice. The ad showed Brant and his grandfather, don José Matsuwa, Allen said. In the ’89 triathlon, Allen was neck-in-neck with Scott in the run. “I was at the point where I were ready to give up in the marathon, because he was really strong,” he said. “This image of don José came back to me, and it just gave me the confidence to go for it. Secunda, a shaman in the Huichol tradition from Mexico’s Sierra Madre mountains, said it was natural to meet the triathlete — he’s worked with many types of people over the years. “He was very humble, so it fit into the whole Huichol paradigm of how to be a good person and a strong person,” Secunda said. Boulder triathlete Barry Siff said their book isn’t at all about how to win an Ironman. Siff said he’s thrilled they came to Boulder. “I knew they did (retreats) in Santa Cruz, and I thought Boulder would be really receptive,” he said. The modern world is full of great technologies that save us time and reduce the physical demands of just about any task. But along with these savings comes an unspoken expectation that things will get done more quickly, and that each of us will be able to do more in a shorter period of time. Add on a huge dose of competitiveness for jobs, housing, and just about anything else you can think of, and the result is that a lot of us have less time experiencing a sense of peace and more time trying to keep up with the demands of life. This has had a negative effect on many people’s outlook. Three out of four of us describe the workplace as stressful. And for those under 18, the percentage soars to 85% who feel under stress. But take heart, help is here! If you’re depressed, stressed out, anxious, or fatigued, the cure might be right outside your door. New research from Holland shows that people who live near a park or wooded area experience less depression and anxiety. And a study from the UK found that a walk in the country reduced depression in 71% of participants. Scientists have long known that sunlight can ease depression – especially in winter. When you tap into the regenerative power of your environment, it can have instant and profound effects on your mood, transforming negative emotions such as fear, depression, anger, and anxiety into a peaceful, happy state of mind. Just about every single person has gone for a walk at some point in their life. Have you? How did you feel when you finished? Probably much better than when you started! Walking is an ancient tool of transformation. And the great thing is that you don’t have to specifically be in the wilderness or even a park, for walking to work its wonders on your mood. Even in the middle of a city, if you go outside and walk for a few minutes with the intent of disconnecting from whatever may be causing you stress or anxiety, those precious moments afford you the chance to feel the sunlight on your skin, to breathe in air that has not passed through an air conditioning system, and to feel your feet walking on Mother Earth. These three things will transform your mood naturally and almost instantaneously, just as it did for our ancestors thousands of years ago. Of course, if you do have access to a natural setting, the effects are enhanced and can improve more than just your mood. Research has shown a number of great positives to spending time in nature. Children who are allowed to have unstructured play in nature, for example, develop an improved ability to focus on school tasks later. They also show a higher level of creativity than those who don’t spend time doing this in their early years. It has also been shown that walking on uneven ground raises intelligence. The mechanism is thought to be from an increase in pathway development between the various parts of the brain that are stimulated by having to stay upright on uneven ground. So if you want to be smarter, walk in nature! But let’s get back to how profoundly positive even a small dose of time spent walking and being in an outdoor environment can be for your mood. Often because of tight scheduling and a job that keeps us mostly indoors, a lot of people in the modern world are actually ‘nature deficient’. This is because we are all designed to thrive in the outside world. Here is how it works. Our ancient genetics are set up to give us a positive mood when we move. The only time our ancient ancestors were sedentary for any length of time was when food was scarce; it was an advantage to not move around much. The adaptation that we all have in common to this scenario is that it causes a bit of depression. Depression is actually a survival mechanism. As we know, this mood gives us a feeling like being out of gas and being unmotivated to do much, which in ancient times conserved calories during the parts of the year when food was scarce. Walking and moving were signs that there was likely something to find to eat – and along with that came a positive outlook. We can get our ancient genetics to do their job to bring us a positive outlook simply by exercising, and when we do that in nature, it’s a double shot of espresso – courtesy of the inherent energy and power in the outside world. We say that Mother Earth is always emitting love, which in the Huichol tradition (an indigenous tribe in central Mexico) is the strongest power of all. By walking outside on the earth, we absorb this power and it strengthens our bodies, our souls, and improves our mood naturally. You can activate this same sense of well-being anywhere outside. It could be by simply sitting next to a creek or the ocean and listening to the sounds of the water. It could be by watching a sunrise or a sunset and breathing the colours of the sky into your heart. This inherently makes us feel part of something bigger than just ourselves, part of something grand that has gone on for millennia. One of the nine keys we write about in our book is Honour Yourself. Part of what this requires is that each of us takes the time to shift our moods using these simple tools. We honour ourselves by going outside when we feel the shift in stress go from manageable to unmanageable and just walk for a few minutes or sit quietly in a park or garden. Honouring yourself says, “I am not my bad mood or my anxiety.” It’s a statement recognizing that, deep inside, you have love for yourself, for life, and for others, and you will make the time each and every day to bring yourself back to this memory. The simplest and quickest way that we have personally found to do this is to boost our mood with nature. To bring fear or worry into perspective, focus on a positive event in nature that will continue whether you face your fear or not. Recall the colours of the last sunrise you saw, or think of the present season and its inevitable progression into the next one. You’ll see that such large events continue – whether you and your fears are there or not. As we have emphasized take a walk outside – someplace where you feel peaceful. Put one foot in front of the other slowly, and quiet your internal chatter. With each step, visualize the earth’s love coming into your body through your feet and dissolving any problems you have. If you’re suffering from the moody blues, anxiety or angry stress, the key to your mental health may be right outside your door. According to Brant Secunda and world champion Ironman Mark Allen, authors of Fit Soul, Fit Body: 9 Keys to a Healthier, Happier You, connecting with nature not only brings beauty into your life, it can significantly boost your mood. Here’s what they had to say about the power of nature in improving your mental health. New research from the Netherlands shows that people who live near a park or wooded area experience less depression and anxiety, and a study from the UK found that a walk in the country reduces depression in 71 percent of participants. Scientists have also known that sunlight can ease depression — especially SAD, or seasonal affective disorder, in winter. Secunda and Allen say that there are many reasons nature is so effective in lifting people’s spirits. They are connected to life, to the beauty of all of life and the majesty of creation. Being a part of a sunset or sunrise makes our soul happy, therefore also affects our body. Taking the time to simply experience nature can calm our nervous system. By being close to nature we feel a part of life, we feel connected to the birds, the flowers, the trees, and the earth. This process of being connected helps take away depression and other negative emotions, bringing us more happiness that will carry us every day of our life. Going outside is the first step in connecting with nature, but your intent will significantly enhance nature’s positive effect on your mental health. Here are a few techniques from Fit Soul, Fit Body: 9 Keys to Healthier, Happier You. Go to a river or stream and breath in the sacred sound of running water. This simple act helps to make your spirit beautiful. Just think of your plants at home — when they get watered they look beautiful. If you live on the coast, a good technique for washing away loneliness, depression or anger is to go to the ocean and breathe in the beautiful sound. Then as you breathe out, visualize your exhale letting your problems go. Sit on the earth and feel the sky above you and imagine the light of the sun coming in through the top of your head. This helps take away anger and loneliness by helping you feel connected to something grand. It helps you feel a part of life all around you. A deceptively simple tool is to just go out with friends and family to a beautiful place in nature and talk, laugh or even discuss problems. Go for a walk, run or hike in a natural setting. While you are out in nature, look around at the world going on around you. Forge a connection to the trees and plants and animals around you as you move through this setting whose elements are almost eternal. This can take your focus off your own challenges and help you see that there is a whole world that is enduring and wondrous. It helps us see that, ultimately, even with life’s challenges we are part of this amazing circle of life. One way to draw energy from the earth when you feel depleted is to walk outdoors with intent, and with each step you take, try to visualize Mother Earth’s power rising into your body. The power of Mother Earth is love. Imagine love coming into your body, making your body strong. Love is a tangible power and emotion that many indigenous cultures consciously work with, and it can help all of us living in the modern world.